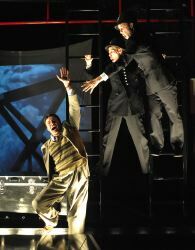 The 39 Steps is an homage to many of Alfred Hitchcock’s famous movies. But unlike the intense dramatic thrillers of Hitchcock that leave people on the edge of their seats, this stage adaptation turns out to be a farce, full of humor and great expressions by the talented cast of four. The audience on Sunday was a little slow (but had no trouble talking loudly to each other), but once they caught on they laughed along gladly. The only actor to play only one character throughout the evening was Jeffries Thaiss as falsely accused murderer Richard Hannay. Thaiss had the calm English attitude all through the evening and never seemed to get ruffled, except when he comes across a beautiful woman. Then his eyebrow goes up a notch. The other three actors (Susan Lynskey, Jason Lott and Evan Casey) played a myriad of roles that included a victim, a Scottish couple, several police detectives-turned spies and a slew of others. This included not only changing into a new character, but also changing clothes. This they did with speed and dedication, including several scenes where they changed into other characters in the middle of a conversation, ending up playing each other! The set for The 39 Steps was simple, yet incredibly creative. Scenic Designer Cristine Todesco took the lab theatre space and created many locales, including a moving train, a house, an inn and an alley. A few scenes used projections by Designer JJ Kaczynski. Actors Jason Lott and Evan Casey made the chase scene on the outside of the train great not only with their acting, but athleticism needed to hang on to a moving ladder while the “train” moved along. It was an excellent scene! Another great use of selling the action with limited space was the “plane scene” from North By Northwest. One man was the pilot while the other held hats out front like steering wheels and managed to fight each other while trying to fly the plane. This was an extremely humorous scene which again involved great timing and expressions by the cast to really sell the moment. 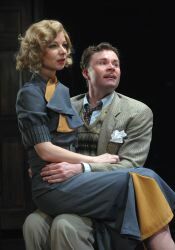 The 39 Steps was an engaging farce played well. Don’t go into this trying to figure out who the spy is, go into this expecting to have a great time. 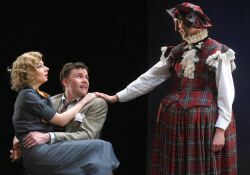 In the stage adaptation of The 39 Steps, we see this selfsame world as in the original “thriller” novel: a man on the run from wrongful accusations of murder, charming spies lurking in the Scottish countryside, and suspense around every corner. 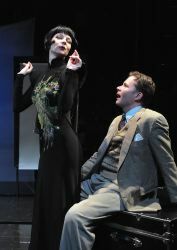 However, playwright Patrick Barlow executes the world of the “thriller” genre in a completely opposite direction of Alfred Hitchcock’s 1935 film adaptation. He creates through farce. While doing complete artistic justice to both Buchan’s original work and Hitchcock’s film, Barlow’s farcical take on the material provides us with a true homage to the theater. Not the contemporary theatre of spectacle we see today with massive moving sets and superheroes flying above the audience on wires. He pays tribute to our sentimental vision of the theater by creating so much with so little. Barlow does this by celebrating the artifice of the theatre and theatricality. We suspend our disbelief when watching theater as an audience, but farce takes this experience another step further: it draws our attention to the skillful exploitation f a situation, making the highly improbable completely plausible on stage. The play itself exists within a very civilized world of proper English mannerisms and cultured charms, the very thin “veneer of civilization” that Deborah Buchan mentions. 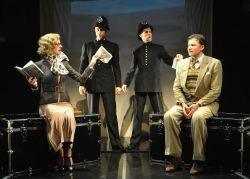 But instead of revealing the shadowy underworld of pre-war espionage as the book and movie do, the play shows that within the context of the theater, this story is ripe for farce and satire. Who does one trust when spies are all around? Jeffries Thaiss and Susan Lynskey. This article can be linked to as: http://showbizradio.com/go/8259.